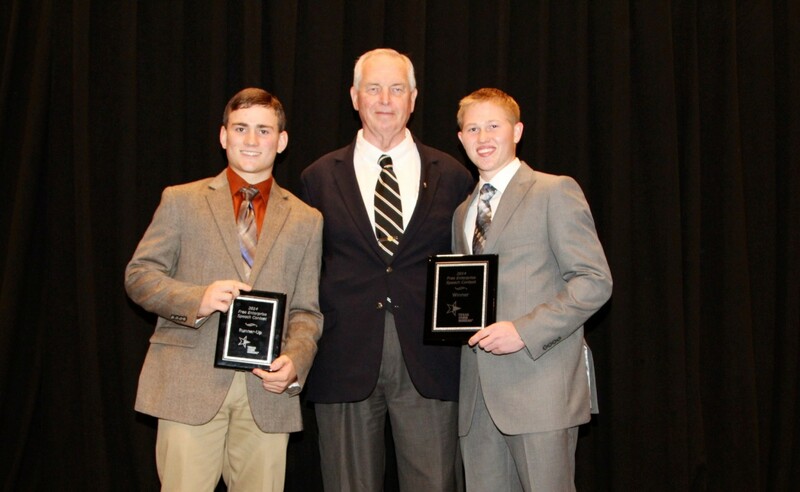 CORPUS CHRISTI — A high school junior from Stephenville took first place and a $6,000 scholarship as winner of the 2014 Free Enterprise Speech Contest at the 81st Texas Farm Bureau annual meeting. Conner McKinzie, 17, son of Marty and Kelli McKinzie of Stephenville, topped 12 other speakers from across Texas in the annual contest. At Stephenville High School, he is district and chapter president of the FFA and a member of the cross country team, Spanish Honors Society and Erath County 4-H. He also is a national qualifying meat judger and state and national AgriScience Project Champion. McKinzie plans to attend college and major in Meat Science with a minor in Agricultural Technology. He hopes to join the research and development teams for major agricultural companies to advance the technology of feeding the growing population. Runner-up in the Dec. 6 competition and winner of a $3,000 scholarship was Dylan Davidson, 17, a high school junior from Childress. The son of David and Lori Davidson, he plans to attend the United States Naval Academy and one day become a lawyer. At Childress High School, Davidson is active in the FFA, National Honor Society and athletics. Four other finalists and winners of $2,000 scholarships were named, including Ciera Ware of Crosby County, Carson Wienecke of Lampasas County, Victoria Martin of Houston County and Victoria Burns of Willacy County. The six finalists will receive an expense-paid trip to Washington, D.C. to visit elected officials, witness Congress in session and visit historical sites. Other contestants and winners of $1,500 scholarships were Morgan Sharp of Baylor County, Kendall Gregg of Tarrant County, Jacob Hays of Wood County, Sarah Posey of Fisher County, Katherine Kendrick of Bexar County, Sara Zahn of Wharton County and Anne Lowak of Wilson County.